Nativity Scenes From Uruguay. Only Fair Trade nativity scenes from Uruguay are on this page. Uruguay has about 2500 species of flora distributed in 150 biological families, both native and foreign. "Ceibo" or Erythrina crista is the national flower in Uruguay. 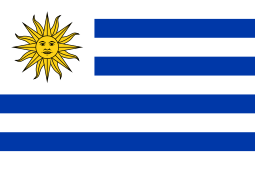 Nearly 95% of Uruguay's electricity comes from renewable energy. The dramatic shift, taking less than ten years and without government funding, lowered electricity costs and slashed the country's carbon footprint.